LAST GAME 10/23/11: Bears 24 at Buccaneers 18 in London. Chicago RB Matt Forté rushes for 145 yards & TD. Bears WR Roy Williams adds 59 receiving yards, including 25-yard TD. LAST GAME AT SITE 9/21/08: Buccaneers 27, Bears 24. Tampa Bay WR Antonio Bryant catches 10 passes for 138 yards. 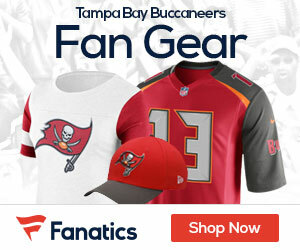 Buccaneers DE Gaines Adams records 45-yard INT-TD. BROADCAST FOX (12:00 PM CT): Thom Brennaman, David Diehl, Laura Okmin (Field reporter). SIRIUS: 136 (TB), 113 (Chi.). XM: 227 (Chi.). BUCCANEERS: QB JOSH MC COWN played in 8 games (5 starts) for Chi. last year & set franchise record with 109 rating, incl. 13 TDs & 1 INT, topping HOFer Sid Luckman’s mark (107.5 in 1943)…Rookie RB CHARLES SIMS had career-high 13 carries & 16 touches last week…Rookie WR MIKE EVANS had 7 catches for 209 yards & 2 TDs last week, youngest in NFL history with 200-yard rec. game. Is only rookie in NFL history with 7+ catches, 100+ rec. yards & TD catch in 3 consecutive games. Leads NFL with 458 rec. yards & 5 rec. TDs in Nov. In last game vs. Chi. (11/20/11 with SD), WR VINCENT JACKSON had 7 catches for 165 yards (23.6 avg.) & TD…Since 2013, LB LAVONTE DAVID is only player in NFL with 250+ tackles (259), 5+ sacks (7) & 5+ INTs (5). DE JACQUIES SMITH had career-high 2 sacks & FF last week. DT GERALD MC COY has 4.5 sacks in past 4 & 14 sacks in past 17. S DASHON GOLDSON has INT in both career meetings vs. Chi. S MAJOR WRIGHT played 1st 4 seasons with Chi. (2010-13) & had 9 INTs, incl. 3 TDs. CB JOHNTHAN BANKS had INT-TD last week… BEARS: QB JAY CUTLER has won both career starts vs. TB…RB MATT FORTÉ has 338 scrimmage yards (169 per game), 234 rushing yards (117 per game) & 2 TDs (1 rush, 1 rec.) in 2 career meetings. In past 7 at home, has 1,081 scrimmage yards (154.4 per game), 665 rush yards (95 per game) & 7 TDs (4 rec., 3 rush)…WR BRANDON MARSHALL has 12 rec. TDs in past 12 at home. Since 2012, has 31 rec. TDs, 3rd in NFL. Had 2 TDs last week. WR ALSHON JEFFERY had 11 catches for 135 yards & TD last week. TE MARTELLUS BENNETT had 5 catches for 72 yards & TD in last game vs. TB (9/16/12 with NYG)…DE WILLIE YOUNG ranks 3rd in NFC with 8 sacks. Had sack last week. LB LANCE BRIGGS aims for 4th in row vs. TB with INT or FF. DE JARED ALLEN aims for 3rd in row vs. TB with sack. Since entering NFL in 2004, leads league with 131 sacks. CB TIM JENNINGS has 11 INTs in past 19 at home. Since 2012, is 2nd in NFL with 13 INTs & ties for 3rd with 3 INT-TDs.